When Rick Sheldahl, Career and Technical Education Director of the Durham (NC) Public School System, and Don Ramsey, carpentry instructor at Southern School of Energy and Sustainability visited ShopBot in 2014, they were looking for an affordable CNC machine that could help their students set up a production shop. Rick had budgeted about $25,000 for the PRSalpha with a spindle that would take a full sheet of plywood. ShopBot welcomes visitors and gives tours (with an appointment), but it is primarily a production facility and does not maintain a showroom. So the only full-size gantry tool available to demo was the 4′ x 8′ ShopBot used in the production of ShopBots, which includes the Automatic Tool Changer (ATC) and Vacuum Hold Down system. Don and Rick were smitten. 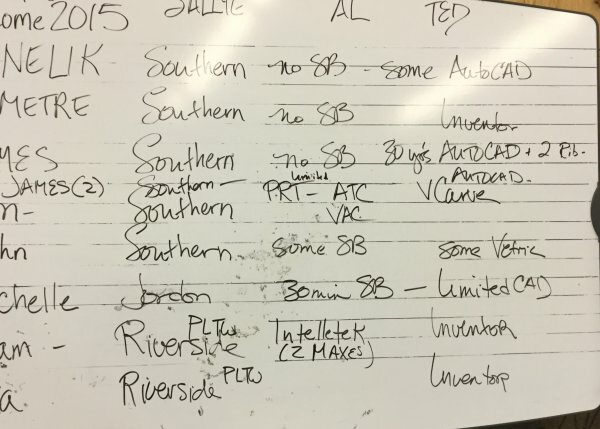 With visions of training students for the work world, creating quality furniture that could be sold and the proceeds going towards scholarships for the students, and summer programs that would not be subject to the “bells” of the regular school year, Rick reworked his budget to purchase the full Production package for Southern High. Fast forward to the end of the school year, 2016. 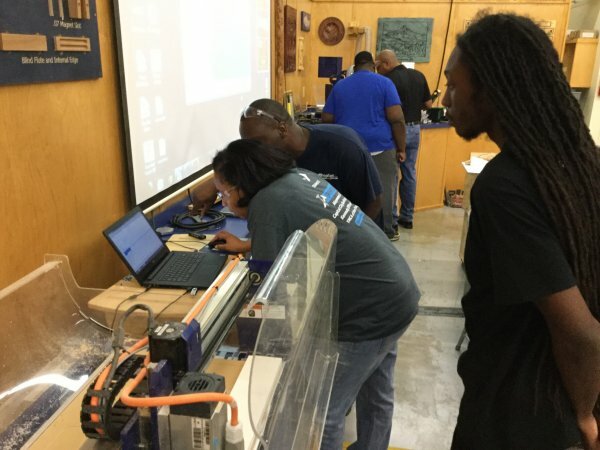 Rick found himself with an opportunity to purchase CNC equipment for other high schools in the Durham Public School System that would be useful for CTE and STEM education. So, he ordered a number of the smaller ShopBot CNC machines: Desktops (24″ x 18″ cutting area), and a Desktop MAX (24″ x 36″ cutting area) with Rotary Indexer, Buddy (24″ x 32″ cutting area) with a 4′ power stick for the Production Shop. Then, he arranged for training for the teachers who might have found themselves with a piece of equipment that they had not requested, and had no idea of how or why they might want to use it. Background/experience of teachers and students from the Durham Public Schools (names cropped out to protect the privacy of students). Training took place at ShopBot Tools on a Saturday in September 2016. Teachers and students from three high schools spent the day at ShopBot, getting hands-on experience with ShopBot Desktops and a Buddy. The background and experience level varied. 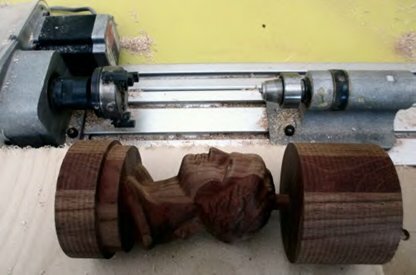 Two teachers were coming from a very strong woodworking background, but with little experience using Computer-Aided Design (CAD) software. Michelle Joyner-Ricci runs the carpentry program at Jordan High School, and has years of experience with making things using traditional hand tools, power tools and mills. 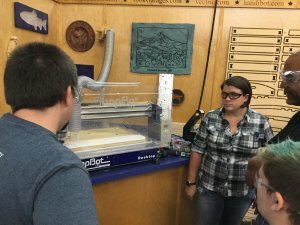 She had requested a milling machine that was adjusted by dialing in the measurements, and instead found a computer-controlled digital fabrication tool in her shop. Prior to the training, she had had a 30-minute introduction to the ShopBot Desktop and VCarve Pro CAD/CAM software at a CTE meeting over the summer. Don Ramsey and his student, a junior, came with a year’s experience using the PRSalpha Production system. They were ready to learn more about how to unlock the capabilities of VCarve Pro CAD/CAM software and the ShopBot. The other three teachers were experienced in Computer-Aided Design (CAD) software such as Inventor, AutoCAD, and Revit, but had limited experience with how to take those designs and use Computer-Aided Milling/Machining (CAM) software to prepare them for machining on a CNC machine. Adam Davidson and his student from Riverside High School participate in the engineering curriculum, Project Lead the Way, which uses Inventor as its CAD program. The program includes PLTW’s CIM (Computer-Integrated Manufacturing) component to manufacture the objects designed in the 3D-rendering CAD software, but Mr. Davidson did not regularly use the older CNC machine they had at the school. Demetre Harris (Southern) uses Inventor, and James Lee (Southern) had 20+ years of experience using AutoCAD in the real world before singing on to teach AutoCAD at the high school level. Two other students from Southern also attended the class. Instructors Sallye Coyle and Al Nyonteh introduced themselves and showed examples of the types of machining strategies possible with the ShopBot. Sallye also described the different types of bits used to create each of the strategies. 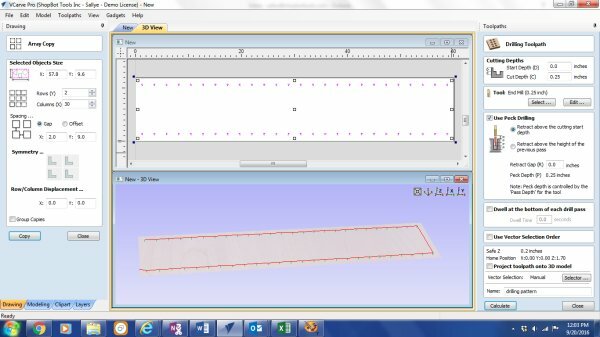 Hands-on experience with using the ShopBot control software to move a ShopBot around in X, Y and Z axes, and writing simple commands to tell the ShopBot where to go went a long way towards removing some of the mystery. Moving the ShopBot around in the X, Y and Z axes. Al and the teachers/students watching the ShopBot Desktop in action. A tour of ShopBot’s facility gave ideas of what kinds of careers are available at a small-scale manufacturing facility: everything from Production to Engineering/Product Design/Electronics, to Customer Support areas such as Technical Support, Sales Marketing and Business Administration. Throughout the building are examples of things that were made with a ShopBot: vacuum tables for holding down parts while machining, prototypes of aluminum parts for new products, signs made of acrylic that include moving parts and lighting with LEDs controlled by Arduino programmable electronics (shields or circuit boards machined on a ShopBot), desks that take advantage of ShopBot’s precision to make living joints (bendable plywood) or press-fit joints, ShopBots making Handibots. Samples machined in 3D with or without the rotary indexer were also a source of inspiration. Working in pairs, teachers and students went through an exercise that demonstrated the entire process from design idea to finished product. 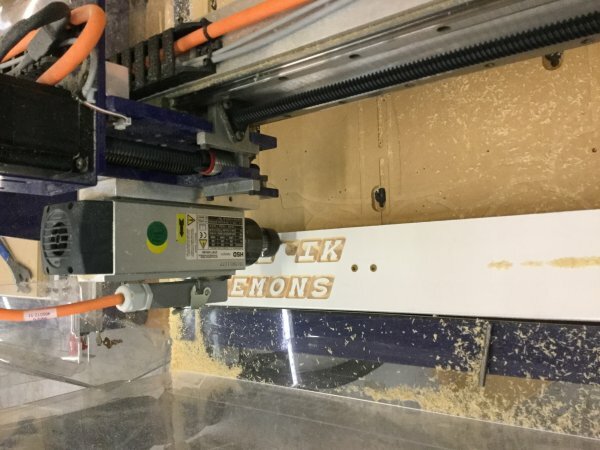 They used the CAD ( what and where) side of VCarve Pro to design a sign, the CAM (how) side to toolpath the design so that it would look engraved, and generated the machine code that the ShopBot would use to move the tool in the correct paths. 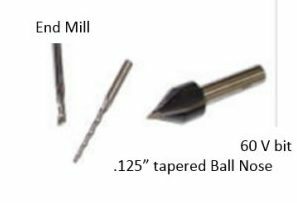 Included in the design and toolpathing options was an example of how to place hold down screws in the work piece so that the work piece would not move under the spinning router bit, and the spinning bit would not hit a hold down screw. Using VCarve Pro CAD/CAM software to design and toolpath signs. Teachers and students working with each other and ShopBot’s Al Nyonteh, to set up their files. The Desktop carving a student’s file. Note the screws that are holding down the board for machining. Each participant then set up a ShopBot to machine their sign. Using a checklist and printed instructions, and with the help of the two ShopBot instructors, participants changed the bit, zeroes the X and Y axes, and placed the material on the machine bed in the appropriate orientation, zeroed the Z axis, ran the files to locate the screw hold position, screwed down the material, and ran their sign file. Safety precautions were emphasized, an instructions on how to “Air Cut” a file before actually placing the bit in the material saved at least one router bit from being set down onto a screw and getting broken. After lunch, Ted Hall, ShopBot’s Founder and CEO, gave a brief talk about ShopBot’s origins and capabilities. He brought over a Handibot, ShopBot’s newest product, and talked about FabMo, the open source Control System that is being written in-house. Several teachers/students talked with Ted while others finished their sign projects. Ted Hall, Founder and CEO of ShopBot, gave a brief history and philosophy of ShopBot. Samples of items created with a ShopBot abound in the training area and throughout the company. 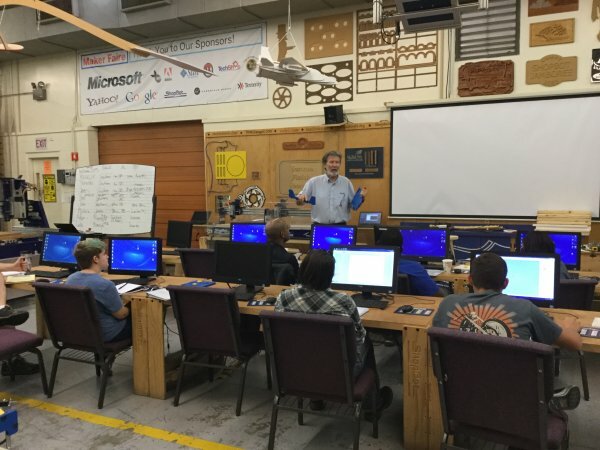 Once everyone in the room had completed their first project, the afternoon was open so as to give demos and information on how to successfully use the software or set up the machining files in the way that would be most useful for the individual teacher and student. 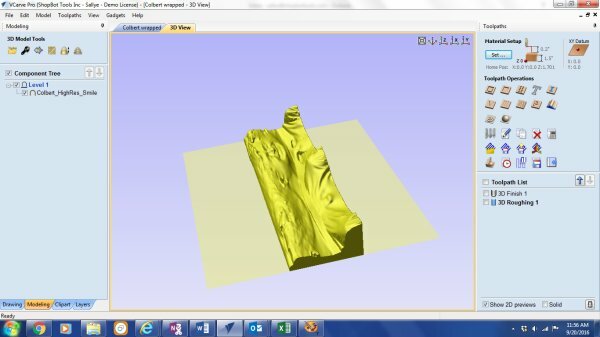 Importing 2D and 3D designs created in another CAD software, feeds and speeds and bit selection for different materials, how to create an array of holes for cabinet making, and how to use the Rotary Indexer were among the topics touched upon. Participants left with a notebook full of instructions, and ideas for lesson plans and 2D & 3D projects that link to Common Core and Next Generation Science Standards. Setting up a CAD/CAM file to machine holes in the sides of a bookshelf. 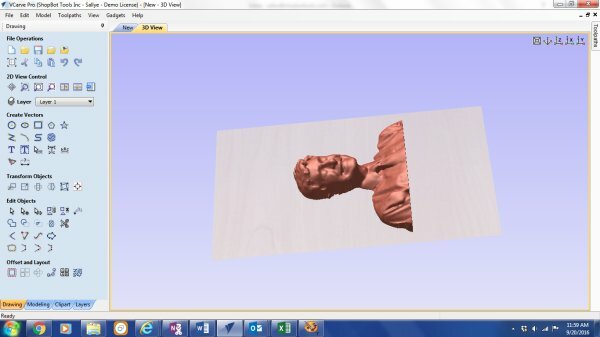 A 3D model of Stephen Colbert downloaded from the Thingiverse website and imported for 3D machining on the ShopBot. The same model being prepped (unwrapped) for machining in the round with the rotary indexer. An example of carving in the round done on the rotary indexer. In this setting, students and teachers worked side-by-side to master techniques unfamiliar to both of them. The introduction of new technology often goes more smoothly when teachers are comfortable letting students take the lead in mastering new techniques and then sharing that knowledge with others. As the only teacher there with experience using the ShopBot, Mr. Ramsey proudly showed off pictures of the intricate signs that a young woman in his program had designed in Vectric’s VCarve Pro CAD/CAM software and machined on the ShopBot. 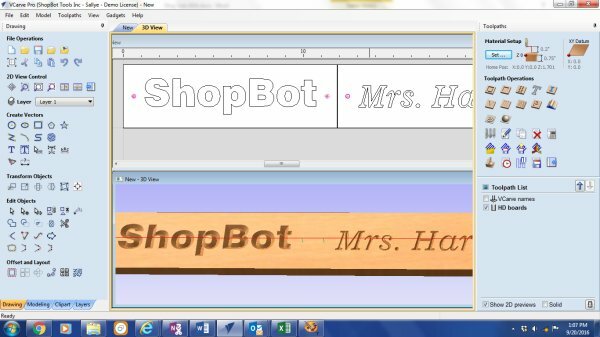 She used the tutorials and videos available on the ShopBot and Vectric software websites to teach herself, and then others, sophisticated ways to import bitmaps (photos), trace them, and toolpath the designs. One of her files took five different bits, and the use of the ATC let her finish the project within one class session because she didn’t have to stop the ShopBot, then physically change the bit and re-zero the Z-axis in between the separate toolpaths. Mr. Ramsey also learned that it is important to have students from several grade levels work together so that his “experts” don’t all graduate at one time, and he has to start from scratch the next year. At the end of the day, Mrs. Harris remarked that she was now more comfortable with the machine. 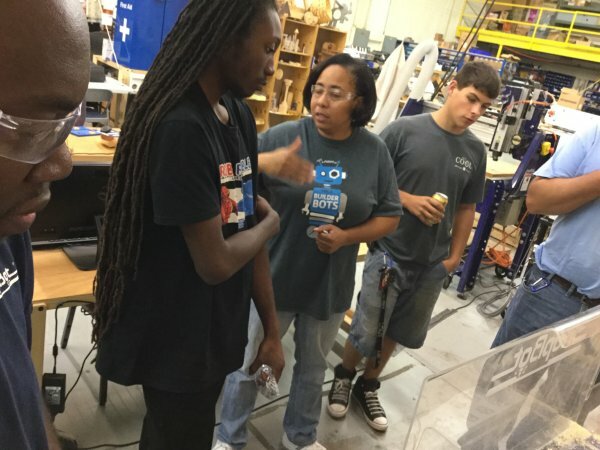 SHe saw that there were many similarities to the 3D printer that she had used at the North Carolina Central University FabLab over the summer. 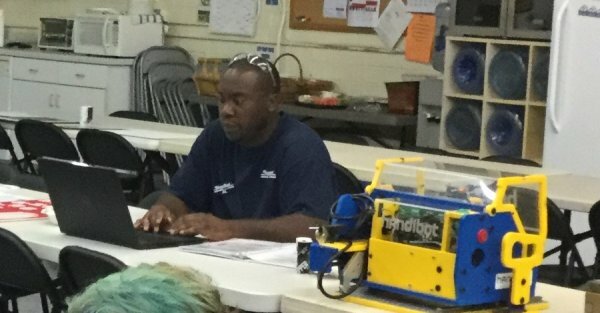 Mr. Lee was not one of the teachers who had been given the gift of a ShopBot CNC, but left with information on what size ShopBot he would like to add to his classroom so that his AutoCAD students could actually prototype and test some of the designs that they had created on the computer. Al Nyonteh, one of the instructors for the training, attended Riverside High School up to 1997 then transferred to a military school (Tarheel Challenge) for at-risk teens. After graduating in 1998, he studied architectural technology (a drafter that specializes on the architectural side of building construction) at a two-year college in Minnesota. Al worked in a commercial architectural firm for two years (in MN) and with an electrical engineer to create the drawings for the relocation of the electronics department at Circuit City (in VA). After moving back to NC, he worked as an independent contractor to prepare evacuation plans and submit health department drawings for group homes/alternative living facilities. Al joined the production team at ShopBot in 2014. 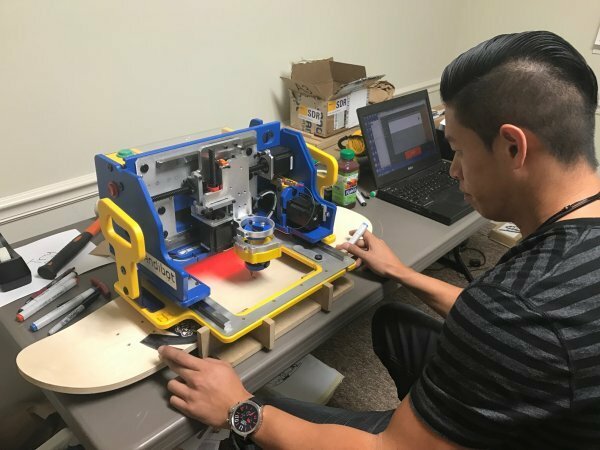 He is motivated to learn everything about running a ShopBot, and often uses his lunch period and after-work time to design in VCarve Pro and machine on the ShopBot and Handibot. His gentle way of working with people and sense of humor make him a go-to person for in-house trainings, and when someone is needed to represent ShopBot at shows and Maker Faires. Al Nyonteh, instructor, attended Durham Public Schools. He studied architectural technology in a two-year program in Minnesota. Al joined the production team in 2014, and is “fluent” in AutoCAD VCarve Pro CAD/CAM software, and running ShopBot tools using both ShopBot and FabMo control software. Matt Schmitz went to Durham School of the Arts, where he studied sculpture and theatre tech. He says it was a great place to learn about creative thinking and iterative design. Sculpture and theater tech led to an interest in product design. Matt studied Mechanical Engineering at Brown, graduating in 2014. In 2012, as a sophomore in college, he interned at ShopBot, and worked with CEO Ted Hall to develop the first functional prototype for the portable CNC that would become Handibot. He interned at Google during his senior year, working on the Nest Project (a high-tech smoke/CO detector). He currently works in Product Development, developing the next generation of ShopBots, and for Production Support, developing tools and solutions for clients with specific production needs. Matt Schmitz, an engineer with ShopBot working in Product Development and Production Support, studied sculpture and theater tech at Durham School of the Arts. While a student in Mechanical Engineering at Brown University, he did internships at ShopBot and Google. Lee Beatrous attended Cedar Ridge High School (Orange County, NC), taking two years of woodshop class with instructor Keith Yow. Lee furthered his education at Appalachian State University. He started with a focus on Business Marketing but changed direction by entering ASU’s School of Technology and earning a BS in Industrial Design. After winning a Popular Design Vote at the High Point Furniture Market in a sponsored studio competition, Lee went on to work for GSI – a furniture manufacturer in Dallas, TX. He held the position as Project Design Manager for five years. Lee is currently working for ShopBot Tools at Handibot as a Manufacturing Engineer, seven years after working a summer internship at ShopBot in the Production department. 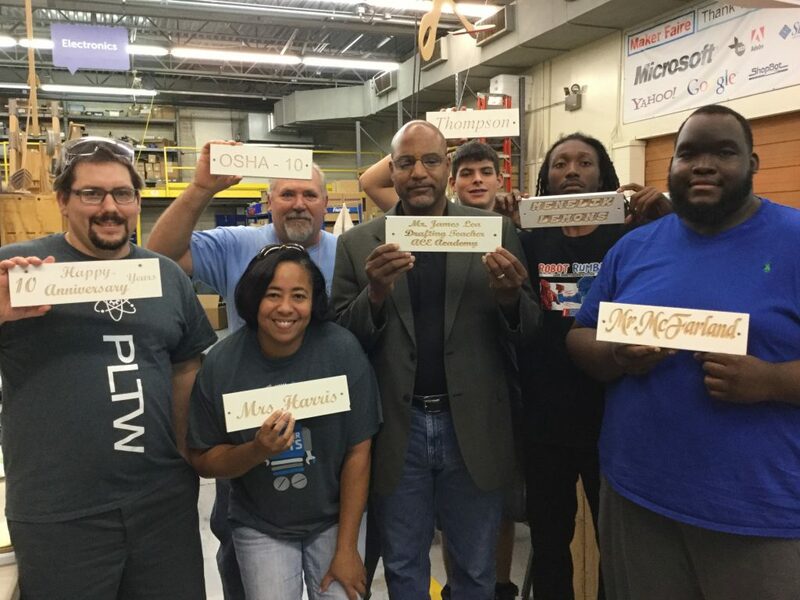 Lee Beatrous, Manufacturing Engineer for Handibot, took wood shop classes while at Cedar Ridge High School in Orange County, North Carolina. 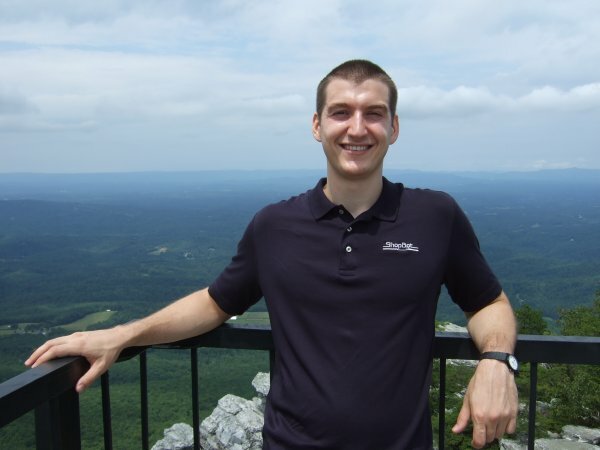 He studied Business Marketing and then Industrial Design at Appalachian State University. In this photo, he is using the plotter pen attachment to draw on a skateboard. The bed and holes for the trucks on the skateboard were cut on a ShopBot, then formed into the shape of the board.